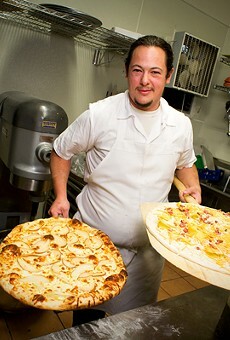 Chris Duffey Nick Yapor-Cox's organic sourdough crust is chewy and crunchy, with a hint of tang. Hours: Tue.-Thu. 5-9 p.m., Fri. 5-10 p.m., Sat. 3-10 p.m., Sun. 4-8 p.m.
On the surface, "Oakland-style pizza" sounds like it might be the punch line to a bad joke, or, at the very least, a simple marketing ploy. In fact, it turns out to be the concept behind Nick's Pizza, a tiny shop on Shattuck Avenue that opened earlier this year in the space that used to house Pizza Plaza, a vegan pizzeria. 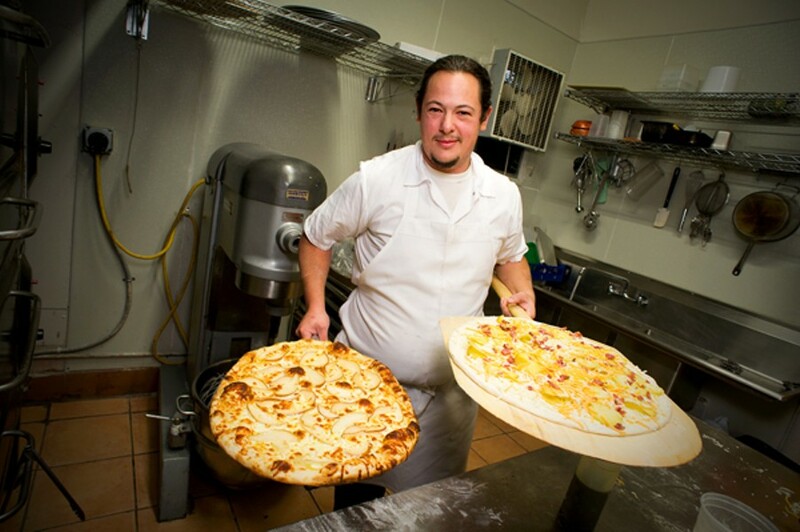 Conceived by Nick Yapor-Cox, an Oakland native who grew up just blocks away, Nick's Pizza does, indeed, serve a style of pizza that's largely unique to the Bay Area: locally sourced seasonal toppings and a sourdough crust. It's an approach familiar to anyone who's ever stood in line at The Cheese Board or at Arizmendi, where Yapor-Cox spent four years earning his sourdough stripes. The important thing is that the pizza is pretty great. This is despite the fact that the restaurant lacks the trappings of other so-called artisanal pizzerias, which seem to sprout up every other week. There's no table service, and room for only maybe ten svelte individuals to sit. Everything is dished out on those fake-wood plates I've always associated with camping trips. In addition, Yapor-Cox said he didn't have hundreds of thousands of dollars to spend on, say, a wood-burning oven built with bricks made from the ashes of Mount Vesuvius. He just uses a regular gas deck oven. "Oakland's a scrappy city," he said. "My style comes out of the idea of making the best food from what you have at hand." Any discussion of the virtues of Nick's has to start with the organic sourdough crust, which is as good as any I've had (organic or not). Yapor-Cox adds high-quality olive oil and quite a bit of salt, resulting in lots of flavor with just a hint of sourdough tang. The pizzas are crisp-bottomed, from tip to end — a crispness that held up even after my takeout order sat in the box for forty minutes. The dough is a little thicker and more substantial than what you'll find at Arizmendi, so it has an appealing chewiness too, in addition to its crunch. I enjoyed one intensely mushroomy mushroom-and-roasted-leek pizza and another that featured apple slices and sweet "Oakland-style" pulled pork (okay, I call BS on the use of the moniker there). Even better was a pizza topped with prosciutto and arugula — and I normally hate pizza with salad on top. Here, the saving grace is restraint: There wasn't so much peppery arugula or salty prosciutto to distract you from the excellent, slightly spicy house-made tomato sauce underneath. 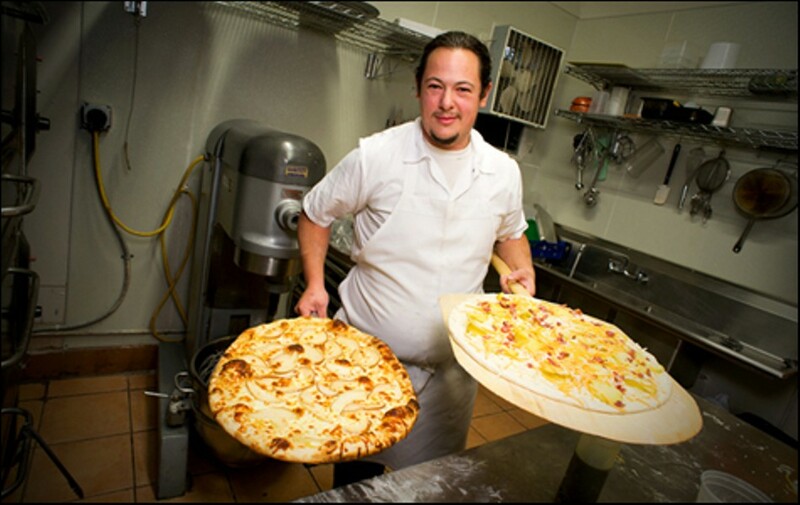 One reason Nick's offers a superior pizza experience than Arizmendi or The Cheese Board (as great as those wildly popular — but completely vegetarian, pizza-wise — institutions are) is that there are meat options. I also appreciated that amid the frou-frou toppings — here in the land of fruits and vegetables — there's always pepperoni pizza available. The slice of pepperoni I had might have been the best of the whole bunch — the cheese and sauce in perfect proportion; the pepperoni full-flavored, not like some of the blandly wholesome varieties you'll find around these parts. Fair warning: The pizzas at Nick's aren't cheap, ranging from $20 to $26 for a sixteen-inch pie, at least during my two visits. But if you're strapped for cash, several of the pizzas are always available by the slice — and buying eight individual slices isn't any more expensive than getting a whole pie. They reheat beautifully. Just a block away from Nick's sits maybe the saddest Pizza Hut takeout center in the world: a tiny transparent box of a store that resembles nothing more than a prisoner holding area, complete with bulletproof glass. In sharp contrast, Nick's is every bit as tiny a space, but has made a name for itself by being a warm, community-minded kind of place. There are coloring sheets for kids and a Jenga set available (if you can find the few inches of extra space on your table); the staff is, to a person, friendly and down to earth. And every few months, the restaurant hosts a community dinner where anyone can come and enjoy a free slice or two. Yapor-Cox said he and his wife came up with a name for the overall vibe: "Hipster with a Heart of Gold." If you think about it, that's as much in keeping with the "Oakland style" as anything else.